Anything pique your interest? Contact us now! Plumbing is one of the most enjoyable and exciting careers. It entails various activities such as installation, repair, maintenance of pipes and other equipment used in the distribution of water and disposal of waste in both residential and commercial buildings. As a beginner, it’s essential for you to make a list of plumbing tools that will help you carry out your day to day activities and improve your performance. Tape measureA tape measure is a simple but essential tool that every plumber must have. It’s used in measuring various dimensions of the plumbing system. 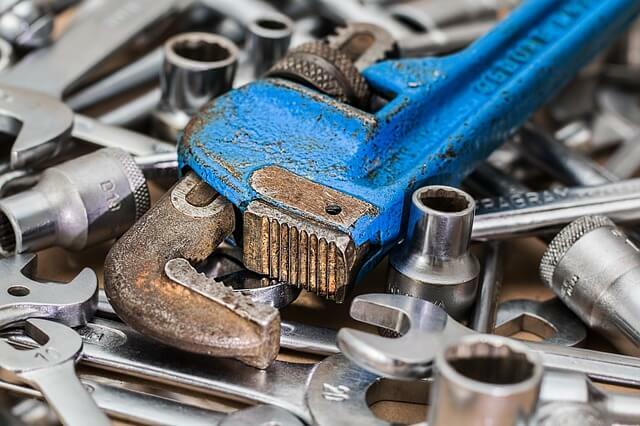 Wrenches vary with the size of the jaw head, shape, purpose as well as their handle size (see our post on the best adjustable wrench for more info). They play a critical role in holding, turning, removing or even fitting plumbing pipes and fixtures, which is why they should be included in your plumbing tools list. ScrewdriversScrewdrivers should also be included in your plumbing tools list. They come in different sizes and shapes. They help in either screwing or unscrewing a wide variety of connections with the aid of nuts and nails. Pipe and tube cuttersThese plumbing tools have adjustable heads to fit the size of the tube or pipe. They are used to cut both metallic and plastic equipment and should be part of your plumbing tools list. Gloves, goggles, and ear plugsAs a plumber, you’ll be expected to work in different settings. As a result, you’ll always be at risk of injury. Ear plugs, goggles, and gloves should be in your plumbing tools list to minimize the severity of injuries and enhance your safety. Teflon tapeTeflon tape is used on faucets, pipes as well as other components of the plumbing system to ensure that the connections are tight and leak-proof. Hacksaw and handsaw.Both the hacksaw and handsaw are essential items on your plumbing tools list – they’ll aid you in cutting materials such as plastics and wood. Needle-nose pliers as well as the caulking gun. Finally, the following equipment should be a part of your emergency plumbing tools list. Adjustable and waste pipe slicers. Have anything to add to these lists? Leave your comments below and share your own plumbing tools list! Come down to Hanover Supply and get what you need from our extensive commercial plumbing supplies section. Looking for a specific piece or part? Hanover Supply Company is New Jersey’s best supplier for residential, commercial and industrial plumbing; heating and cooling; remodeling products and product redistribution. We support both homeowners and trade professionals with years of supply experience.